You are here: Home / Baby / TwoSweetPotatoes (Etsy) Organic Bamboo Velour Wipes #Giveaway! Lucky, lucky me! TwoSweetPotatoes (a wonderful Etsy shop!) sent me a sampler of Organic Bamboo Velour Wipes. Actually, it is lucky for my baby’s bottom – these OBV wipes are the softest material you can use on baby bums! If you have never owned any wipes or blankets made from organic bamboo velour, I highly recommend this wonderfully lush material, you will love the feel of it – and so will baby! As a baby wipe, these are an excellent Eco-friendly choice for even the most sensitive, delicate skin. You can use these with plain water or with your favorite wipes solution. I love that both sides of the wipe are the plush bamboo velour, so no matter what part of them touches baby’s skin, it will be soft. TwoSweetPotatoes has eliminated the need to fold wipes to fit into wipes container and wipes warmers. The convenient 7.25 x 4.25 inch wipes fit perfectly into them without folding! There are several color options to choose from: fushia (pink), orchid (purple), turquoise, apple (green), orange, and natural. You can purchase wipes in sets of 8 and there is also a Starter Set of 30 — you pick the colors you want. Visit TwoSweetPotatoes to check out other organic infant and toddler products like onesies, bibs, tees, pants and more. How would you like to WIN a SET of 8 of these luxurious Organic Bamboo Velour wipes (for yourself OR for your baby)? Winner gets to choose the colors! You will love them, so go ahead, ENTER! Giveaway is open to USA residents and will close on May 22 at 11:59pm PST. Random winner will be selected by the WP plugin “And The Winner Is” and e-mailed with 48 hours to respond and claim their prize. Mandatory: Visit TwoSweetPotatoes on Etsy and let me know the name of your favorite Set of 8 wipes. Please include your Google Friend Connect name in your comment (all giveaway entrants must follow my blog GFC). *Add TwoSweetPotatoes to your Favorites on Etsy. *Add this giveaway to any giveaway linky and come back here to comment and leave me the link to where you posted it. *Make a purchase from TwoSweetPotatoes Etsy shop during the giveaway dates and receive one bonus entry for every dollar you spend! Comment with your Etsy name and invoice number for validation. *Fun Entry: What is another item you’d like to have from TwoSweetPotatoes Etsy shop? Disclaimer: I was provided a set of wipes free of charge for review purposes. All opinions expressed are my own, based on experience with the product. Sponsor is responsible for giveaway prize fulfillment. Previous Post: « Green Toys on SALE at Zulily! TODAY Is The Time To Buy! I love the wipes in creamsicle. Another item I’d love to get is the Amelia top. It is adorable. I follow via GFC (Danielle Knapp) and I love the apple/turquoise wipes. I follow as Charity and John. I like the creamsicle wipes. I like the organic bib and burp cloth set in orange dot. I love the apple/turquoise set of 8! I like the Organic Bamboo Velour in Fuscia and orchid. I follow you via GFC, as Cupcake Mama. Another item I love is the Pink Bird Onesie. I love the creamsicle wipes! I like Two Sweet Potatoes on fb! 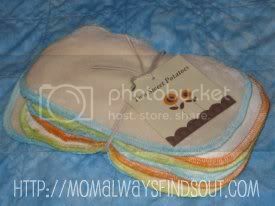 I would really like to try the sailor baby pants only I need them in a 2t! I also like the Organic Ruffle Baby pants and the Pink Fields Drooler bib! I like the Creamcicle set. GFC user Rachel R.
Another favorite item is the anchor onesie (http://www.etsy.com/listing/71540608/organic-onesie-long-or-short-sleeve). I love the drooler biub with the airplanes on it. I liked TwoSweetPotatoes on Facebook! I liked MomAlwaysFindsOut on Facebook! I love the creamcicle wipes. I would also like to have the The Drooler – Organic Bib – Sweet Jane, it’s so cute! I like the Apple/Turquoise set. I really like the Apple color the most. The other product I like in her Etsy shop is the Amelia top in the orange color. I also like the Blue Swirl burp cloths. I love the both the apple/turquoise and the fuchsia/orchid wipes! I can’t choose! Fun Entry: I’d LOVE to get TwoSweetPotatoes Organic Onesie Long or Short Sleeve in the Tree Print or the Bird Print! I follow Mom Always Finds Out on FB! I love the apple/turquoise! I follow under Kathryn! I like the drooler bib! I like the Organic Bamboo Velour Wipes – Set of 8 in apple/turquoise. I like Two Sweet Potatoes on facebook as Hannah Rae. all so pretty but I’m picking the creamsickle. Just added to my favorites on Etsy and following you! I would love the snappy sacks! I like MAFO on Facebook! I follow MAFO on twitter! I like TwoSweetPotatoes on Facebook! I love the Amelia Top! I like the drooler bib. I like the blue swirl bibs and the navy outfit. I like the apple/turquoise set. I like the apple & tourquoise set the best. My GFC name is Kimberly. I love the apple turquoise wipes! The Amelia top w/the dandelion puffs = ADORABLE!